It actually may not be correct to call this a ‘video’. 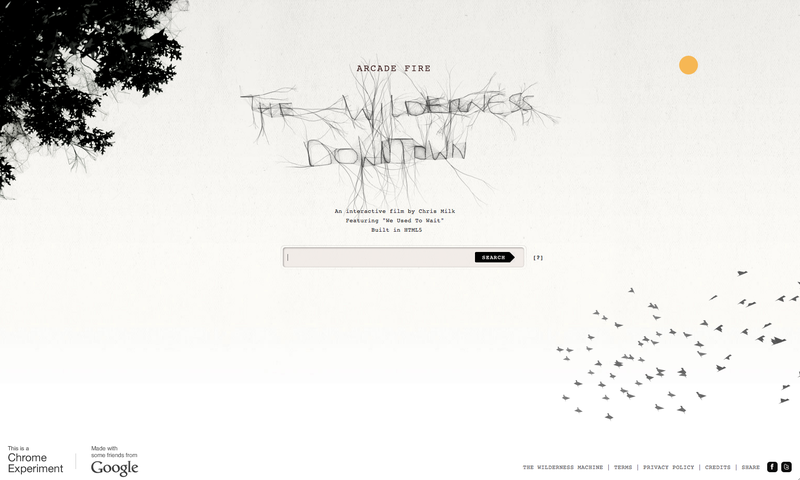 On the site, it’s referred to as ‘An interactive film by Chris Milk‘ called The Wilderness Downtown. It uses the song ‘We Used To Wait’ by Arcade Fire as sort of the musical score. It’s unlike any music video I’ve seen before because it uses Google Maps for images of the house and neighborhood which you’ve entered. Another outstanding feature is the use of multiple PC ‘windows’ opening and closing to the beat of the song. Very cool! PS…You’ve seen this clip of Bowie performing with Arcade Fire in NYC’s Radio City a few years back…right? Awesome. This entry was posted in Hip Films, Hip Internet stuff, Hip Music and tagged Arcade Fire, Chris Milk, David Bowie, Hip music, hipster approved, We Used To Wait, Wilderness Downtown, YouTube by HipsterApproved.net. Bookmark the permalink.